All Web addresses mentioned were functional as of 11-1-16. From the Cumberland Gap to the Atlantic Ocean, this is Virginia Water Radio for the week leading up to Election Day, November 8, 2016. This pre-election week, music by a Blacksburg- and Roanoke-based band sets an ancient stage for some observations on water’s potential place in voters’ decisions. Have a listen for about 30 seconds. You’ve been listening to part of “Waters of Babylon,” performed by No Strings Attached, on the 1999 album, “In the Vinyl Tradition Volume II,” from Enessay Music. The tune and its title trace back to Don McLean and Lee Hays on the 1971 album, “American Pie”; then to an 18th-century song by Philip Hayes; and finally to the Bible’s Psalm 137. That psalm was a lament by Jews exiled to Babylon from Jerusalem about 2600 years ago. At the time, Babylon was the principal city of Mesopotamia, a region centered in the area of modern-day Iraq in the fertile floodplain between the Euphrates and Tigris rivers. Throughout human history, water has been at the center of civilizations and human interactions. In the 21st Century, water remains a focal point in international affairs. According to the United Nations’ Global Water Forum, “Water security has become a central feature of the global policy agenda” and “a source of conflict not only within countries but across international boundaries.” As a recent example, some observers believe drought in Syria—part of which is in the Euphrates River basin—was one factor increasing unrest that eventually became the country’s current civil war. Oregon State University’s Water Conflict Management program notes that the world has 286 river basins crossing international borders, as well as shared groundwater aquifers, generating a range of transboundary water issues. And the United States has big impacts on several global issues related to water—climate, energy, food, public health, and biodiversity. Add that all together, and water’s clearly on the agenda in U.S. leadership choices. In fact, when Scientific American asked 20 science questions of the four U.S. presidential candidates on the ballot nationwide in 2016, at least eight of the questions were about water explicitly or about issues directly tied to water, nationally or globally. U.S. elections at all levels have implications for water policy and management, from federal water-quality laws to local drought-management ordinances. But in national elections, U.S. citizens’ choices can also have implications for waters far beyond our shores. That makes water one more reason to use your citizen voice and vote, however and for whomever you choose. “In the Vinyl Tradition Volume II,” containing “Waters of Babylon,” is copyright 1999 by No Strings Attached and Enessay Music, used with permission. More information about No Strings Attached is available from their Web site, http://enessay.com/. The No Strings Attached piece was based on "Babylon" by Don McLean and Lee Hays on the 1971 album, "American Pie," from United Artists Records. According to various sources, that recording was in turn based on a song (or canon) written by Philip Hayes in 1786 that put to music Psalm 137 of the Bible's Old Testament. 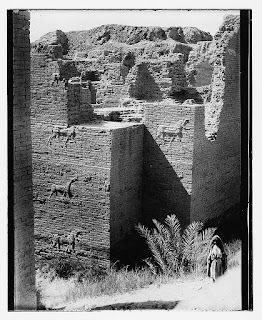 Ruins of Babylon’s Ishtar Gate, photographed in Iraq in 1932. Public domain photo from the Library of Congress’ Matson (G. Eric and Edith) Photograph Collection, accessed online at https://www.loc.gov/collections/g-eric-and-edith-matson-photographs/. For information on the Ishtar Gate, please see Ancient History Encyclopedia, “Ishtar Gate,” online at http://www.ancient.eu/Ishtar_Gate/. The word “mesopotamia” is from Greek meaning “between rivers.” Source: Encyclopedia Britannica, “History of Mesopotamia, online at https://www.britannica.com/place/Mesopotamia-historical-region-Asia. The four U.S. presidential candidates participating in Scientific American's survey of 20 science questions (published in September 2016; see citation of Christine Gorman below in Sources) were Hillary Clinton, Democratic Party nominee; Gary Johnson, Libertarian Party nominee; Jill Stein, Green Party nominee; and Donald Trump, Republican Party nominee. *Mapping the Resilience of International River Basins to Future Climate Change-Induced Water Variability. Ancient History Encyclopedia, “Babylon,” online at http://www.ancient.eu/babylon/; “Mesopotamia,” online at http://www.ancient.eu/Mesopotamia/; and “Nebuchadnezzar II,” online at http://www.ancient.eu/Nebuchadnezzar_II/. Bible History Online, “The Babylonian Captivity with Map,” online at http://www.bible-history.com/map_babylonian_captivity/map_of_the_deportation_of_judah_treatment_of_the_jews_in_babylon.html. The Bird Sings Web site, “Waters of Babylon,” online at http://thebirdsings.com/babylon/. 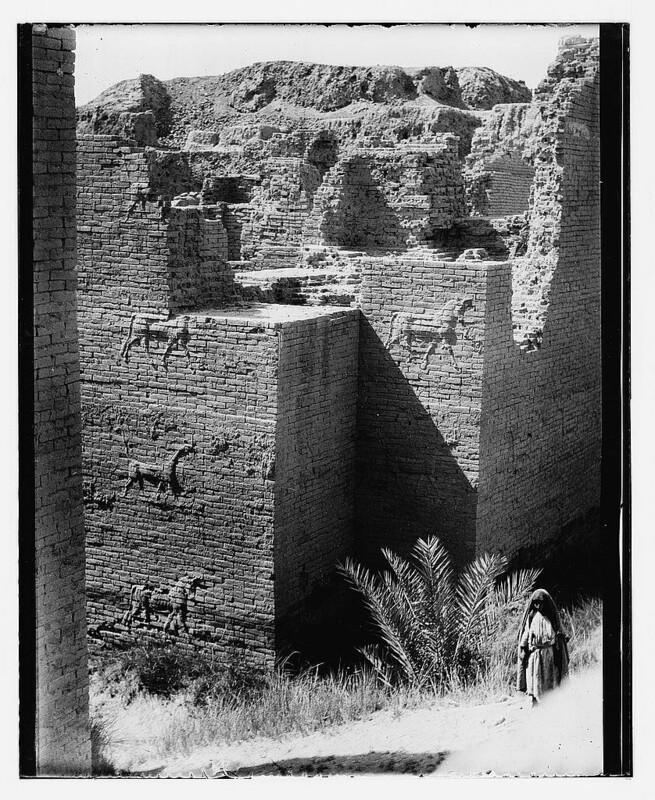 Encyclopedia Britannica, “Babylon,” online at https://www.britannica.com/place/Babylon-ancient-city-Mesopotamia-Asia. ; and “History of Mesopotamia,: online at https://www.britannica.com/place/Mesopotamia-historical-region-Asia. Free Republic Web site, “By the Waters of Babylon,” online at http://freerepublic.com/focus/f-bloggers/3381872/posts. Joan Oates, Babylon, Thames and Hudson Ltd., London, 1979. Don McLean Online, “American Pie,” online at http://www.don-mclean.com/?p=261. MetroLyrics, “Don McLean Lyrics/Babylon Lyrics,” online at http://www.metrolyrics.com/babylon-lyrics-don-mclean.html#/ixzz4ODeE26Ea. Stratfor, “Mesopotamian Vitality Falls to Turkey,” 1/5/15, online at https://www.stratfor.com/analysis/mesopotamian-vitality-falls-turkey. United States Conference of Catholic Bishops, “Psalm 137,” online at http://www.usccb.org/bible/psalms/137. Henry Fountain, Researchers Link Syrian Conflict to a Drought Made Worse by Climate Change, New York Times, 3/2/15. Christine Gorman, “What Do the Presidential Candidates Know about Science?” Scientific American, 9/13/16, online at https://www.scientificamerican.com/article/what-do-the-presidential-candidates-know-about-science/. United Nations Educational, Scientific, and Cultural Organization (UNESCO)/Global Water Forum, “International Water Politics,” online at http://www.globalwaterforum.org/resources/education/international-water-politics/. Terje Tvedt, Graham Chapman, and Roar Hagen, eds., A History of Water Series II/Volume 3: Water, Geopolitics and the New World Order, I.B. Tauris, London/New York, 2010. All Water Radio episodes are listed by category at the Index link above (http://www.virginiawaterradio.org/p/index.html). See particularly the “History” or “Overall Importance of Water” categories. Another episode on a worldwide water topic is World Water Needs, Episode 122, 8-6-12. WG.15 - migration and cultural diffusion, including effects of environmental factors.